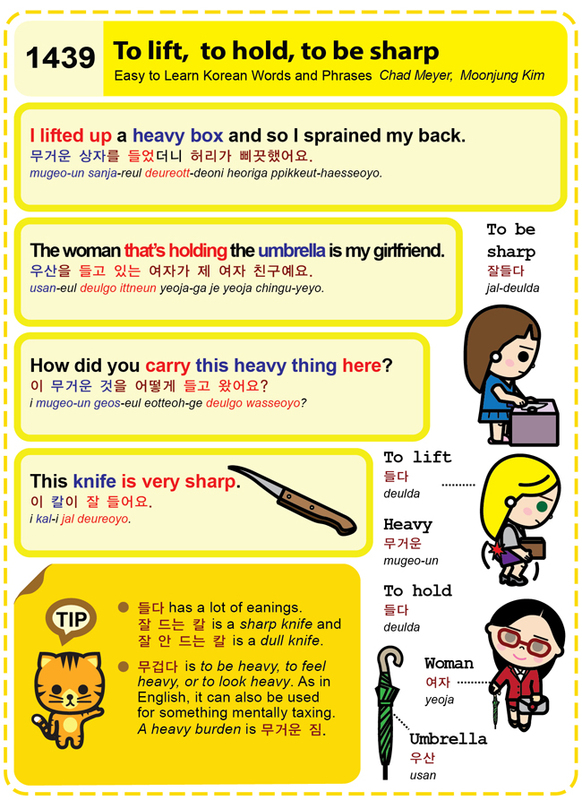 Easy to Learn Korean 1439 – To lift, to hold, to be sharp. This entry was posted in Series and tagged dull knife, heavy, heavy burden, How did you carry this heavy thing here?, I lifted up a heavy box and so my back went out., or to look heavy, sharp knife, something mentally taxing, The woman that’s holding the umbrella is my girlfriend., This knife is very sharp., to be heavy, to be sharp, to feel heavy, to hold, To lift, umbrella, woman, 들다, 무거운, 무거운 상자를 들었더니 허리가 삐끗했어요., 무거운 짐, 무겁다, 여자, 우산, 우산을 들고 있는 여자가 제 여자 친구예요., 이 무거운 것을 어떻게 들고 왔어요?, 이 칼이 잘 들어요., 잘 드는 칼, 잘 안 드는 칼, 잘들다 by easykorean. Bookmark the permalink.